When a friend back home emailed me a workout at my request, she suggested I find myself a 10-pound weight. I had given her the parameters: I want to stay in shape while we’re in Berlin by doing indoor workouts that won’t disturb our ornery neighbor downstairs. I have no equipment at my disposal. Could she help? Her reply was a screenshot of a workout she’d led with fellow rowers back in the Twin Cities, and it included “TGUs,” which she suggested I look up online. I learned that TGUs are Turkish Get-Ups, in which you lie down and then get up off the floor while holding a weight over your head. I looked around our sparse apartment for a 10-pound weight. Certainly nothing we’d packed in our suitcases would come close to that, as the heaviest things we’d brought for our year’s stay were our winter boots. I turned to our landlord’s shelves, half-populated with a random assortment of history books from his university days. 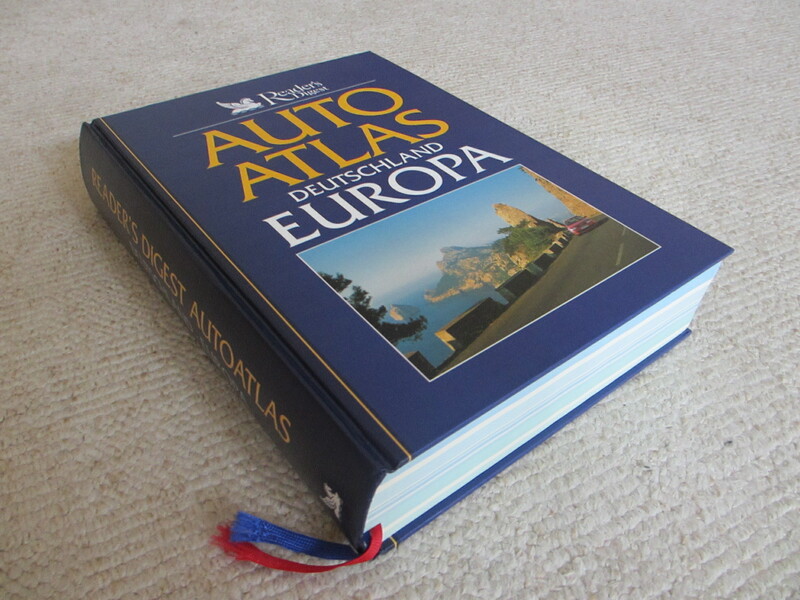 One book stood out: a hardbound Reader’s Digest Auto Atlas for Deutschland and Europa. I lifted it and saw that it would stay closed if I held it by its spine. Sure enough, it would become my new workout companion. About five days a week I lift this Auto Atlas over my head in a series of Turkish Get-Ups. I saw from YouTube videos that you’re supposed to keep your eyes on the object above your head, presumably to keep your arm straight and keep the weight—usually far heavier than 10 pounds—from crashing down on your head. So with all this handling of the Auto Atlas of my newly adopted country, I can’t help but think about the ways this atlas sheds light on my life. First of all, we have no auto in Berlin. We don’t need one; we don’t want one. For fun I pulled up Walk Score and plugged in Berlin, Germany. The website uses density metrics to assess the walkability of your neighborhood on a scale of 1 to 100. Berlin scored a 100. “Walker’s Paradise,” it’s called; “Daily errands do not require a car.” Suffice it to say we don’t really need an Auto Atlas either. Like many other objects our landlord has provided us, this one has been repurposed to suit my needs. This atlas is also a reminder that I’m not getting out of the “flat” (I still can’t say the word without putting air quotes around it) often enough. Sure, our family went to Paris for a week over fall break. But day in, day out, I’m quite comfortable working on this wine-colored laptop of mine, gazing out the windows toward the Tiergarten and the Ku’Damm and all that lies beyond in Berlin. We’ll be here for a whole year, and the urge to make myself go out and be a tourist in my own city is both enticing and a burden, as weighty as that book over my head. The urgency to see every corner of this city is dampened by the knowledge that we have until next July to see it all, combined with the frequent refrain of locals who say they don’t know all of Berlin either; it’s such a big city, and besides, everything they need is in their own neighborhood. It’s almost a complaint, the reality of the 100 percent walkable city. There’s little incentive to get out and explore new neighborhoods when everything you need is at your doorstep. When I see the atlas on the bookshelf it reminds me that though we’ve scrambled our regularly scheduled lives for the sake of a one-year sabbatical in Berlin, we have each found ways to structure our lives here. For our daughters, school serves that function. My husband divides his time between libraries, operas, the piano, and errands. Like him, I’ve had to find a way to structure my days so they are meaningful. It would be all too easy to go back to bed after the kids leave for school and wallow in dismay at being cut off from my lifelines back home. But lifting the atlas over my head as part of my morning workout is something I look forward to each day. It’s a positive way to start the day and stay active in between the rather infrequent rows I can manage here in Berlin. During the long winters in St. Paul I have found that the best way to beat the winter blues is to roll out of bed early each morning and erg on my rowing machine in our dark basement, half-asleep, my eyes often still closed, imagining I’m out for a morning row on the Mississippi. There’s no erg in our flat, and there isn’t going to be. I knew I needed the discipline of a routine that was easy to follow and would fill the same function to get through the dark Berlin winter ahead. My goal is to stay fit enough to be able to jump into any boat should the opportunity arise. It may sound foolish, but it keeps me motivated, so I don’t question it. Discipline in rowing extends to writing. If I can do the Turkish Get-Ups, the pushups, the burpees, then maybe I can sustain this blog. And maybe if I keep writing this blog, I can prove to myself that I have a book in me. Maybe more than one book. Because I think I was supposed to be a writer in this lifetime. I gravitate toward jobs that require writing skills, but they never quite result in the assignments I sought. Just what I’m looking for is the question that plagues me back home. Trying to figure out what book I can possibly write in the moments stolen from my busy life in St. Paul has been confounding; trying to find time to write it almost impossible. Around the time I started following my friend’s workout plan I started this blog. Both have continued with regularity. I take this as a sign. I am also struck by the fact that I am lifting a book over my head in my exercise. It’s almost as obvious as a scene I recall from some Merchant and Ivory film, in which a man more enamored with literature than the woman who loves him loses his life when a bookshelf collapses on top of him. This hardback book I hoist could clunk me on the head any day now, so I keep my eye on it as I balance it in the air. I’m going to get you someday, I think. I’m going to write one of your kind. And as overt a symbol as the collapsing bookshelf, this book I’m lifting even gives me my theme. It’s a road atlas to my own future, a path of my own making. Lost in Berlin. If I can write my way through this year, might I find myself on the other side? This entry was posted in Rowing, Sabbatical, Writing and tagged Berlin, Ku'Damm, moving, sabbatical, Saint Paul Minnesota, Tiergarten, Turkish Get-Ups, Walk Score, walkability, workout on October 31, 2013 by Jill M..
You definitely have a book in you. I anxiously await your blogs and am disappointed when there is not one. Keep it up…lost in Berlin is IT. I appreciate your faith in me, Bobbie. Yes, you’re a writer. And a great writer!! And you’re a great composer. Here’s to all our dreams!